A recent article in Cosmopolitan should make a Minnesota mother, a lawyer, the poster child for our contemporary therapeutic culture. According to sociologist Philip Rieff, in a therapeutic understanding of the world, there is “nothing at stake beyond a manipulatable sense of well-being.” There is no concern for the good, the true, and the existence of God. There are no moral reference points beyond the desiring self. Picking up the narrative at the point of the final pregnancy, here is Ms. Stein’s extended but somewhat rambling explanation of her ethical calculus. After that, Patrick was very clear that he was done. Then maybe a year later, I had just weaned the twins and I had just got my period back. An unplanned pregnancy was not even on my radar. I’d gone through six, seven years of infertility. This was so far off my radar that it took me a couple weeks to catch on. I wasn’t even thinking about pregnancy. I took a test and then it was nighttime, the kids were in bed, and I went down to Patrick and I was like, “Hey, guess what?” It was one of those things where we have a similar sense of humor and it was so Murphy’s Law, we just had to laugh about it. After all that trouble and all that time, to get pregnant by accident, undesired, it was funny. To us anyway. The very idea of having another child at that point was terrifying to both of us. We had two 1-year-old babies and we had two older children. We were both working. There was no way. There was no energy, period, at that time. We were holding on by our fingernails. When you’re in the zone of infertility and you really want a baby, it is a physical thing, in large part. Obviously there are some mental aspects, but physically, your body wants a thing. That’s part of the stress of it. It’s this physical thing, like when you are super, super hungry, and your body starts to freak out, or if you’re donating blood and you start to bleed out. It feels mental, but there’s this aspect of it that makes it much more acute. At least, that’s how it works for me. That was gone at this point. I had all these children and I was no longer in that zone of needing or wanting more children. Obviously I want the ones I have, but not more. It was like, No, this is going to be a physical demand that I don’t have in me. I have four children already that need things, so the idea of what it would entail was overwhelming. I went with a surgical abortion my second time. At that time, I had wondered — I had two babies, and they were 1[-year-olds] — Maybe when they hit 3, I’ll feel differently. Will I want another baby? But as time has gone on, and they have gotten older and are yelling at each other, I have felt more and more like, No, I’m fine with this. I no longer feel that urge to have babies. It’s easier to say, “Hey, my neighbor’s baby is cute, and I would like to hold it and cuddle it and bounce it, because I love babies!” But I don’t need to have another one of my own, because I understand that that baby is only a baby for a year, and they grow up and they still need things for 18 years, and I already have enough on my plate with the four that I have. Maybe someday I’ll want to foster babies, when I’ve gotten out of the crazy zone with own children, or maybe sometime I will help other people with their babies more, or something like that. But I feel like for me, I’ve felt increasingly over the last few years that it’s really OK if I don’t have more babies. [Abortion] is obviously still to me a personal decision for every woman. My own personal feelings are not what should dictate what another woman does with her entire life. I can’t really even get my mind around that way of thinking, to be honest with you. Everyone else can do what they want to do. For me, I can’t be trying to raise a child when I’m not ready to do that. That’s a big commitment. It’s a huge commitment, and I say that as a woman with four children. A major irony in this story is that Ms. Stein carries the name of a very different Hannah—a remarkable woman who struggled with infertility but who lived by a moral system grounded outside herself (1 Samuel 1). “Why I Had an Abortion After Struggling With Infertility for Years” is available online. 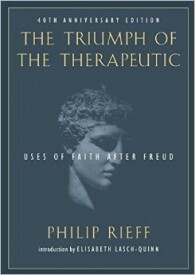 The Triumph of the Therapeutic, by Philip Rieff, is a challenging read but a requirement for anyone who would understand contemporary American culture. Chapter 1, “Toward a Theory of Culture” is available online.